Given a particular savings rate, the choice of asset allocation—i.e. how one’s investments are proportioned among assets of more and less risk—will determine the final value of one’s investments, and is perhaps the most important decision an investor will make. I’ve tried to keep the article as concise as possible, moving some interesting but supporting details to the appendices. In order to set the groundwork for the lifecycle allocation recommendations, it’s important to understand a series of underlying considerations. To protect their savings against the loss of purchasing power that comes through inflation. Their savings alone are insufficient to cover their needs, and consequently they need a vehicle through which their savings can grow. Tolerance for risk — how likely a person is to “stay the course” when experiencing the volatility corresponding to the level of risk they’ve taken on. Capacity for risk — The extent to which a person can afford to take on a given level of risk. A retiree who has just enough assets to cover their needs has no capacity to take on risk, while a young person rich in human capital has plenty. Need for risk — The extent to which a person needs to take on risk. A retiree with $10M in safe assets has little need to take on risk, while a young person whose savings alone are unlikely to fund their retirement does. Consideration 2 — The role of risk tolerance in the determination of investment policy. Your psychological predisposition to risk is irrelevant to the means to reach your investment objectives. This would be like a doctor saying that your preference to wear or not to wear a cast should be a factor in evaluating how to treat your broken arm. You should invest in the way that has the greatest prospect to fulfill your investment goals. Norstad highlights the common, but incorrect, belief that time reduces the risk of a portfolio in the same way that investing in multiple asset classes reduces the risk of a portfolio—i.e. that time diversification works in the same way as asset class diversification. This belief comes from the fact that—and read this carefully—as the time horizon increases, the standard deviation of the annualized return decreases (in proportion to the square root of the time horizon). But while the standard deviation of the annualized return decreases, the standard deviation of the total return increases (in proportion to the square root of the time horizon). In other words, as time increases, the range of possible final outcomes increases. The probability of shortfall doesn’t take into account the magnitude of shortfall—i.e. one should place a higher weight on the possibility of larger losses, and the probability of larger losses increases with time. Options pricing to insure risky asset shortfalls increase with time. DeMuth points out that Samuelson and Merton’s work implies that, other things being equal, one should not invest differently based on time horizon—i.e. that one’s assumed risk level should not change over time. This conclusion, as we will see, doesn’t take into account the aspect of time diversification highlighted in the work of Nalebuff & Ayers. Nalebuff & Ayres argue that time-diversification’s ability to reduce risk depends whether we’re talking about a lump-sum investment made up front, or a sequence of regular investments made over time. Bernstein points out that sequence investing can reduce risk over time, but exposes us to a new kind of risk, sequence risk. 20 years of negative returns, followed by 20 years of positive returns. 20 years of positive returns, followed by 20 years of negative returns. The first produces a much higher final value, since assets were bought at a much lower average price than in case 2. Or more profoundly, The investor had a higher dollar exposure to stocks during the 20 good years with the first sequence (bad returns first) than with the second. This is known as “sequence risk”. However, if instead of annual investments, we consider a lump sum invested at the beginning, the sequence of returns does not matter, as the commutative law of multiplication applies. Lump sum investing is ideal in the Samuelson & Merton sense that it provides a more constant exposure to risk throughout the investing lifecycle, and removes sequence risk. On the other hand, lump sum investing maximizes both potential total risk and return. Sequence investing reduces risk over time—it’s nearly impossible for long-term periodic investing in a diversified portfolio to come out behind—but reduces potential total return, and exposes the investor to sequence risk. DeMuth additionally highlights Fisher Black’s work, observing that, paradoxically, a sequence investor’s constant relative risk aversion (i.e. the conclusion of Samuelson & Morton’s utility theory work) prescribes changing one’s asset class exposure over time, once one’s lifetime financial capital is taken into account. The principle of time diversification is this: just as an investor should spread his investments across different securities to minimize the risk associated with a given expected return, so also should the investor spread his investments across different time intervals to minimize the risk associated with a given expected return. When revisiting Samuelson & Merton’s utility theory work, Nalebuff & Ayres concluded that not only should an iso-elastic investor maintain a constant stock allocation (constant risk profile), but should also maintain a constant dollar amount of stock (constant risk exposure). Consider the example that a given sequence investor’s risk profile is reflected in a 60/40 stock/bond allocation, and his average lifetime wealth is $1M. The would mean that on average he would want to keep $600k in stocks and $400k in bonds. DeMuth points out that a typical sequence investor—with an investment horizon of 75 years between 20 and 95—will not maintain such an average. His largest exposure will be in the middle years, between say 55 and 75, and that’s taking a big risk on one 20-year period. As we’ll see, this leads to the conclusion that one should take on higher risk early and late in life, and less in the middle. An underpinning concept of investing is that spreading one’s investments across a mix of uncorrelated asset classes—stocks, bonds, real estate, etc.—overall risk is reduced through diversification. Bernstein highlights a concern that short-term correlations are increasing, as asset class investing is becoming increasingly accessible. In 1930, investing in timber was practically difficult; today, anyone can invest in timber with a click of a button at your brokerage website. However, Bernstein also points out that long-term diversification continues to provides protection, illustrated in a chart showing 1999 to 2008 returns for asset classes, a time during which correlation was high. As sequence investors, their stocks probably do become less risky with time, or at least do not increase their risk. Their human capital—i.e. their capacity to earn and save—is far greater than their financial capital. In this stage, a 50% loss of financial capital produces only a small reduction of total capital. Even still, Bernstein recommends a 50% stock exposure, with a tilt towards small/value stocks, on the assumption that young people are often not geared to live with the volatility that is likely to be experienced with higher risk—i.e. that even young people will likely have a relatively low tolerance for risk. For young people, Bernstein and DeMuth both acknowledge the need and capacity for risk, but Bernstein ultimately gives priority to avoiding the consequences of overestimating one’s tolerance for risk. A word on savings rate — Perhaps the most under-appreciated aspect for young people of providing for their future financial needs, is the amount which they need to save. Assuming 3.5% inflation-adjusted investment returns, someone wanting to retire at age 70 and maintain their current standard of living, would need to save 20% of their pre-tax salary if they start saving at age 25, or 30% if they started at age 35. Bernstein analyzed people who started saving 20% of their pre-tax salary between the years 1925 and 1980, and calculated how many years it took to reach retirement-level savings. That time fluctuated between 20 and 37 years. These points highlight the profound importance that young people diligently save as much as possible, beginning as early as possible, and deeply understand the possible duration of their committment. 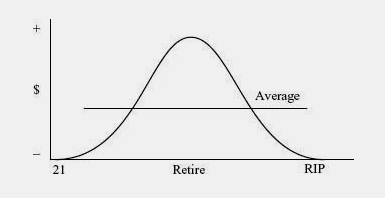 Bernstein prefers to consider the retirement allocation after the early life allocation, since mid-life investing should be understood as a bridge between the two. Liability matching portfolio (LMP), providing adequate lifetime income from low-risk assets. Risk portfolio (RP), containing funds in excess of the LMP. They do not allow withdrawals for emergencies. They require the participant to give up ownership of his or her nest egg. The companies that provide them must make a profit, which reduces payouts. They’re exposed to the catastrophic risk that the insurance companies may not survive. TIPS provide an effective way of protecting one’s cash flow against inflation, but only when held to maturity. Before then, they can prove risky, because their secondary market is thin. In the 2008 financial crisis, long-dated TIPS lost a quarter of their value. When using TIPS to fund retirement, Bernstein recommends a ladder whose maturities at least approximately match one’s projected time horizon. One should not use a TIPS mutual fund or ETF, which may suffer capital loss just when you need the funds the most. Considering the risk of living longer than one’s TIPS ladder vs a default or financial crisis affecting one’s annuity, Bernstein suggests that some combination between the two may be appropriate. Bernstein offers specific strategies for four fictional retirees — Fenwick & Frank (typical), Frasier (sold a company for $10M) and Fritz (sold a company for $4M). These are described in Appendix 2. Consider dividend stocks for the risk portfolio (RP) — Bernstein highlights that although the value of stocks can fluctuate wildly, their stream of income is much more stable. At no point in the history of the U.S. stock market has its real dividend stream fallen by more than half, even during the Great Depression. During the most recent financial crisis, for example, although stock prices fell by more than 50%, dividends also dropped, but by only 23% from their peak, and only temporarily. As time compresses, with an ever-shortening period over which your nest egg needs to sustain you, your allocation to stocks can increase at the same level of payout (or, alternatively, your payout can increase at the same level of stocks). DeMuth also points out that during this time, Social Security is like an inflation-indexed bond, allowing one to make a correspondingly higher allocation to equities. Drawdown rate — Bernstein suggests that below age 65, a 2% drawdown rate is “bulletproof”, 3% is probably safe, and 4% is taking chances. In Rational Expectations, Bernstein provides a rough formula for withdrawal rate: Stocks/100 + Bonds/25. So a stock/bond portfolio of 70/30 would imply a safe drawdown rate of 1.9% per year (0.7/100 + 0.3/100). Mid-life, for Bernstein, marks the period between aggressive investing in youth and conservative allocation in retirement. Bernstein doesn’t discuss specifics of particular allocations during this time, but DeMuth recommends a stock allocation in the neighborhood of 40% to 50%. When to transition to retirement? Bernstein and DeMuth both recommend doing so as soon as you meet you have accumulated about 25 times the annual (real, inflation-adjusted) income that you’ll need for the rest of your life. As mentioned in the discussion of saving’s rate, this can take 20 to 40 years to accomplish for people saving 20% of their pre-tax income. I found taking the time to distill and organize the considerations and conclusions of Bernstein, DeMuth and Norstad to be helpful in framing my own context of lifecycle investing, and I hope you have found it useful as well. It’s concerning to find such disparity in the early-life and retirement recommendations between Bernstein and DeMuth. Investing obviously still isn’t a science. Personally, I find DeMuth’s early-life recommendations more compelling—i.e. I think an effort should be made to convince young people through education to tolerate volatility—while I find Bernstein’s retirement recommendations to be more sensible. Much of the investing theory presented here is based on Samuelson & Merton’s work, focusing on the iso-elastic investor. But in practice, to what extent is (or should be) a typical person’s risk profile iso-elastic? And how does the answer to that question change, if at all, how a person should allocate their savings and assets over time? 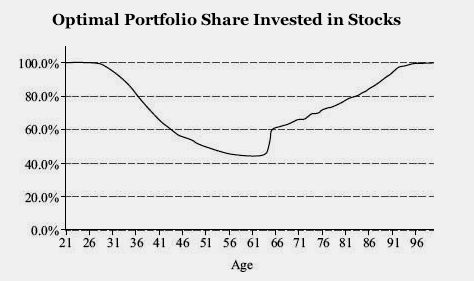 I find it useful to consider retirement as the opposite of early-life investing—i.e. instead of saving and building savings, one is continually drawing down one’s accumulated savings. As such, one is exposed to sequence risk, but in reverse—poor returns at the beginning are detrimental. What about the Permanent Portfolio? Both Bernstein and DeMuth prescribe pre-retirement allocations primarily containing a mix of stocks and intermediate-dated bonds, along with possibly smaller amounts of supplementary assets such as REITS, commodities, gold, etc. The Permanent Portfolio prescribes an asset allocation of three highly volatile, while highly uncorrelated asset classes—stocks, long-term government bonds, and gold—along with a forth asset class, cash. These asset classes were identified to be those classes which respond most dramatically to the four possible states of the economy—prosperity, deflation, inflation and recession. The Permanent Portfolio has, over the years, demonstrated itself to have low volatility, while providing a level of returns that most would find attractive in relation to its relatively low risk. It’s designer, Harry Browne, recommended it to be held throughout one’s entire lifetime, which is consistent with the conclusions of Samuelson and Merton. The only reason I can think of for not investing in the Permanent Portfolio, would be a need to take on additional risk. I would love to hear counter arguments, for example, some objective argument that the historical behavior of the allocation as a whole is unlikely to continue in the future. p>This appendix summarizes the three arguments presented in Norstad’s article, “Risk and Time”. We should keep in mind, that Bernstein points out these assume lump-sum investments. Argument 1 — Utility theory (Robert Merton and Paul Samuelson). A “risk-averse” investor requires a premium. Risk aversion can be measured by utility functions. “Iso-elastic” utility functions characterize those investors whose preferences for risk are independent of wealth, over some “fixed” time horizon. If time reduces risk, one would expect a rational investor—including an iso-elastic one—to take more risk, given a longer time horizon. Samuelson and Morton proved mathematically that for iso-elastic investors, attitude toward risk is independent of time. Considering a S&P 500 stock market index the the probability that a stock investment will earn less than a bank account earning 6% interest is 42% after 1 year. After 40 years this probability decreases to only 10%. The problem with this argument is that it treats all shortfalls equally. Using the same S&P 500 index, the probability of losing money over 1 year is 31%, and drops to 19% after 3 years. But the probability of losing 20% or more after 1 year is 5% and increases to 6.4% after 3 years. Losing 30% or more of our money is 2.8 times more likely after 3 years than it is after 1 year. Losing 40% or more of our money is 9.7 times more likely after 3 years than it is after 1 year. Losing 50% or more of our money is a whopping 71 times more likely after 3 years than it is after 1 year! To use probability of shortfall as a measure of risk, we must attach weights to the magnitude of gains and losses, which is what utility theory does. And utility theory assigns more weight to losses than gains, due to decreasing marginal utility of wealth. Utility theory results are, however, inconclusive. For iso-elastic investors, risk is independent of time. For others, risk can increase or decrease with time. The conclusion is that probability of shortfall arguments are more complex than what they appear on the surface. An “option” in an insurance policy that covers the shortfall in the case that one investment, say stocks, earns less than another, say bonds. Bodie demonstrated that option pricing increases with time. Bernstein provides strategies for four fictional retirees — Fenwick & Frank (typical), Frasier (sold a company for $10M) and Fritz (sold a company for $4M). Frasier really doesn’t need much of an investment or retirement strategy. Almost any prudent mix of indexed global stocks and, on the bond side, short-term Treasuries, munis, and CDs will last Frasier nearly forever. In a taxable portfolio, though, he should hold short-term treasuries instead of TIPS, which, on the short-end should both keep up with inflation, and avoid the accounting headaches of TIPS. As for Fritz, even if he completely annuitizes his new $4M savings at age 62, he’ll only receive about $142,000 per year in inflation-adjusted annual income. The optimal solution for Fritz likely involves some combination of fixed annuities purchased somewhat later in life, part-time work to supplement his income, and a reduction in his standard of living.